When people tell you that spaghetti squash tastes just like noodles, they’re lying. Or their taste buds are off, or they have some magical way of cooking it. But despite not tasting like carbolicious spaghetti, spaghetti squash does taste good, and it is filling enough to use as a recipe base in lieu of a starch. This homey spaghetti squash casserole is satisfying like a much less healthy casserole would be. It also contains enough diverse vegetables and enough protein that you can serve it as a one-dish meal. For extra protein, I’d throw pine nuts or chopped walnuts in the bread-crumb mixture that goes on top of the dish. Slice the squash in half lengthwise, cutting off the ends if desired. It will take some serious strength to saw through/around the squash with a traditional knife, even a sharp one; alternately, for all varieties of winter squash, my husband and I have found the pumpkin-carving tools that come in Halloween packs to be very helpful. The tiny saws that come in a pumpkin-carving kit can work on your spaghetti squash. Once the squash is sawed in half (whatever method you use! ), scrape out the seeds and goo from the inside of the spaghetti squash; again, a pumpkin-carving tool—the tiny shovel—may be useful, or you may want to use a grapefruit spoon. Meanwhile, prep your other veggies, grate your cheese, and crumble your bread. Heat 1 T of oil in a skillet over medium heat. Cook the onions, mushrooms, seasoning, and salt together, stirring frequently, until the onions are translucent and tender. Turn off the heat on that eye. When it is ready, remove the squash from the oven. Let it cool slightly. Turn the oven to 400 degrees. Spray a casserole dish with cooking spray. Using a fork, shred the squash into spaghetti-like strings into the casserole dish. Chop the cloves of garlic that were under the squash, and add them to the squash. Add the onion/mushroom mix, yogurt, and Parmesan, and stir well to combine. Stir in the chopped broccoli pieces. Sprinkle the breadcrumbs on top, and drizzle olive oil and additional herbs on top of that. Bake for 20 minutes, or until dish is heated through and breadcrumbs have begun to brown. Enjoy immediately. 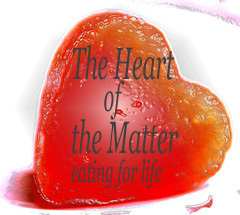 I’m submitting this post to this month’s set of heart-healthy stew and casserole recipes at Heart of the Matter. If you have made a heart-healthy stew or casserole in the last month and blogged about it, submit your recipe to Michelle at mphilli4 at uoregon dot edu by Feb. 24th. Oh my goodness, this sounds delicious! I love spaghetti squash, and I’ve been looking for new spaghetti squash recipes… Thank you for posting this scrumptious, healthful recipe! I love spaghetti squash, but, I admit, I’m one of those people who only eats it with tomato sauce. I’ll definitely try this casserole when we get back from vacation–spaghetti squash is one of the few local veggies that we can still get. a spaghetti squash casserole??? looks and sounds DIVINE!! yum!! I have never seen it here, so we must not get it… It sounds amazing and would solve a lot of my nutritional dilemmas! Thanks for visiting Sally! Good luck on your journey! Sounds delicious! I made a spaghetti squash lasagna a few weeks ago, and it’s back on my rotation of favorite recipes. Would it ruin the texture of your recipe to “pre-cook” your squash just a bit to ease the ridiculous levels of Rambo-esque skills need to carve it open? For my lasagna, I stabbed a few holes in it with a knife, then microwaved it for 3 or 4 minutes (mine was right around 3 pounds). After I let it cool for 5 or so minutes, cutting it open was a breeze. A great recipe and will definitely be trying this with my next bout with a spaghetti squash. I love spaghetti squash too…just had it for dinner last night as a matter of fact. It doesn’t taste like pasta, but the pasta is just a medium for the sauce in my opinion anyway so it’s literally equally satisfying to me! 🙂 Anyway…I always used to boil it forever to be able to cut it, but the last time I made it (last night was leftovers), I microwaved it and, voila, easy to cut and much quicker to make! I micro’ed it for a while whole (maybe 5 minutes), then finished after cutting in half and removing seeds. I LOVE spaghetti squash and this look delicious!! I have one sitting on my counter right now so I’m gonna have to give this a try! I have seen and heard so much about spaghetti squash but haven’t tried it, Sally – your food looks delicious! YUM! I love spaghetti squash (and I agree it totally does not taste like spaghetti). Next time I’m at the store I’m picking one up and totally making this recipe. 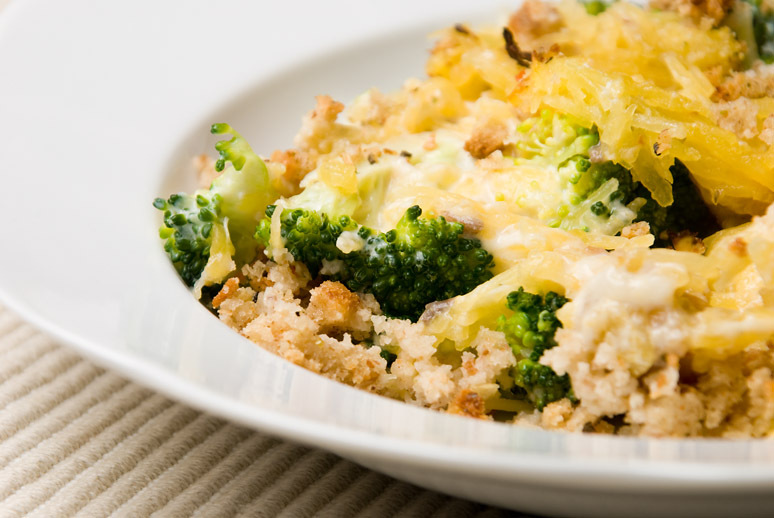 This is such a fabulous, healthy idea for a casserole! I think spaghetti squash doesn’t get used nearly enough in my kitchen…sadly, I think I may have only cooked it once, and did the whole tomato sauce thing. I like your idea much better! Thanks so much for participating (and for the plug!)! Mmm. . . squash of all kinds is one of my favorite things to eat. I can’t wait to try this! I love spaghetti squash, but I find that it needs to be paired with a really aggressive sauce because it has so little inherent flavor. This looks delicious. I was disillusioned with spaghetti squash years ago but your recipe makes me want to give it another try. I just found your blog through a google search – I am a vegan that tries to stay away from gluten… this recipe looks amazing, I’ll have to veganize it. I found your recipe while looking for a vegan casserole to serve at a child’s birthday party. I can’t use the recipe for that purpose but, Oh, I can’t wait to try when it is just for my husband and I. Sounds terrific. *applause* Thanks for posting it. I find that spaghetti squash tastes best when cooked without water. I halve and clean out the squash, then cover the inside and edges with olive oil. Sprinkle with salt and pepper, or what ever you’d like to use. then toss it in the oven for 15 minutes at 400 degrees. This is magical. Hope you try it. I would love to make some of the spaghetti squash recipes could you put the nutrition facts after the recipe? I’m a weight watcher and need the calories fats and fiber at least. Thank you its my frist time trying the squash. I stumbled upon this recipie – with half a squash in the fridge needing to be cooked, the timing was pefect. I made a few adjustments – like I didnt have mushrooms so I left them out and I halved the remaining ingredients since I only had half a squash. It came out really good! Flavorfull, fairly easy, and filling. Halving the recipe made two very nice sized portions, and it was very satifying. Will definitely make again. Thanks for sharing the recipe! Is it casein-free with the cheese?? Emvie–No, it’s mislabeled. When I wrote these posts, I didn’t realize that dairy other than cow dairy had casein. However, the type of casein in cow dairy is far more reactive than other types (sheep, goat) for a lot of people. I can tolerate other types of dairy but now cow. Sorry for the mislabeling!